It's Friday again (already!! ), which means it's time again for the Weekend Blog Walk! This blog walk has been growing SO much, and it's all because of you lovelies who link up every week and share the party with your friends. Thank you a whole heap! Let's get ready to party! If you haven't entered already... check out the Shabby Apple $50.00 gift card giveaway on At Home Take 2. 3) Visit some blogs and show some comment luv. Hi! Following from the Weekend Blog Walk. Thanks for cohosting! Such a fun party, thanks for hosting! I'm stopping in from the Friday Chaos link-up. I'm one of the co-hosts and I'm so glad you linked up! I just linked up to yours too. Hi!! Following from the hop. I hope you have a great weekend! One of my favorite hops of the week! Thanks for hosting! Hi! Thanks for hosting the link-up! Hope you have a great weekend! Hi, I got a late start. Thanks for hosting and I did the one last weekend. I don't think I got around to everyone. http://leavesofoak1.blogspot.com/ Drop by sometime and have a cuppa! Got to go, I have my Grandchildren over night. Hi - Thanks for hosting! I am now a follower & looking forward to cruising all the other great blogs! Following from the hop! Have a fabulous weekend! Thanks for hosting! 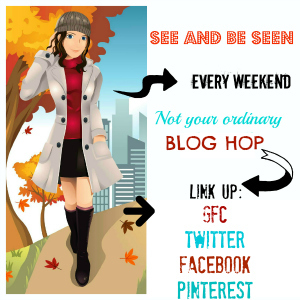 I like your Blog and I am following you in GFC from Blog hop. I hope your visit! Hi! I have linked my blog. My first time here. I am a follower would you follow back. Thank you for hosting.